The choice of dog food causes a lot of anxiety amongst owners of specialist breeds such as the Shih Tzu. There is a confusing list of potential ingredients and it is hard to know what is good and what is bad. Your little pooch’s diet can have a profound effect on their health, appearance, and well-being so this is one decision that you must get right. We’ve put together an easy-to-understand guide to the best dog food for your Shih Tzu. 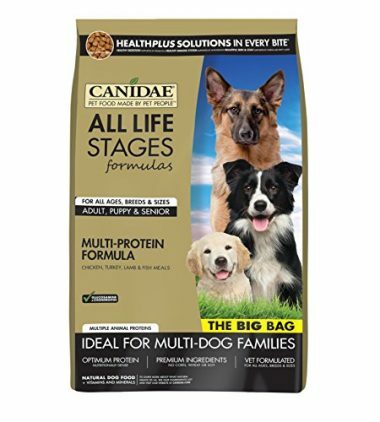 A great generic dry dog food that makes meal times a lot simpler for dog owners! The recipe is vet formulated and suitable for all ages, breeds, and sizes of dog. This is a plus if you have another breed of dog as well as your Shih Tzu. You also don’t have to swap food as your pup grows up. 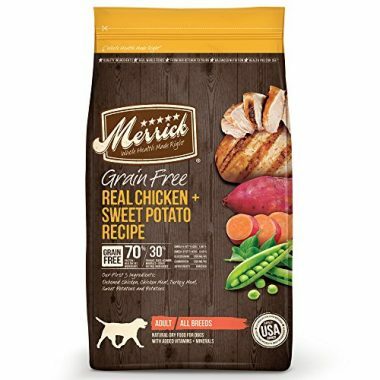 It contains a good balance of crude protein (derived from turkey meal, chicken meal and lamb meal) and does not contain chicken by-products, corn, wheat or soy which can cause upset stomachs in some dogs. 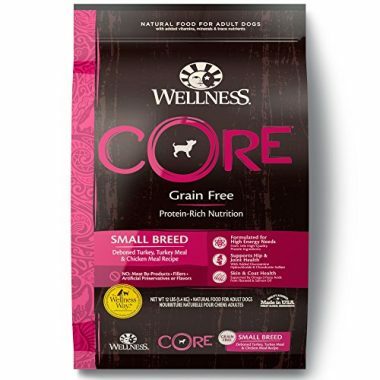 This dry food provides your precious pooch with superior nutrition and health protection. 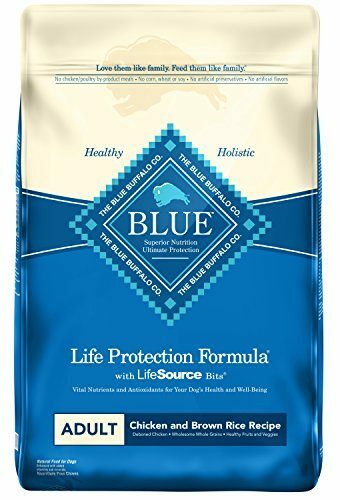 It consists of a two-part feeding system which is a combination of dry kibble and LifeSource Bits which is an exclusive antioxidant-rich formula of vitamins and minerals. The recipe contains only real meat (any chicken is deboned), whole grains, garden vegetables (such as sweet potatoes and carrots) and fruit. There is no corn, wheat or soy and no artificial colours, flavours or preservatives. It’s available in a variety of flavours (lamb, chicken, fish) and pack sizes ranging from 4lbs to 30 lbs. Contains LifeSource Bits packed with antioxidants, vitamins and minerals. A dry dog food specially formulated for small dog breeds. The kibble is a small size and therefore suits small Shih Tzu mouths. Helps with dental hygiene and reduces plaque build-up. Available as a 6lb or an 18lb bag. It’s produced by a family-owned firm that only uses trusted and sustainable sources. The kibble recipe contains chicken from cage-free birds to deliver high-quality protein with an optimal amino-acid profile. Added to the chicken are a range of superfoods (including kale, chia seed, pumpkin, blueberries, oranges and quinoa) and it’s further fortified with vitamin supplements and pro-biotics. The result is delicious and super healthy for your little friend. A dry dog food formulated specifically for adult small and toy breed dogs aged between one and six years and weighing under 25 pounds. The formula has been developed by animal nutritionists and vets and it is endorsed by vets in a survey conducted in 2017. 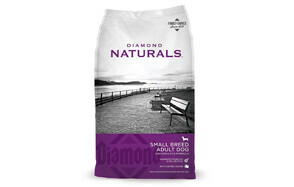 Available as 4.5 pound or 15.5 pound bags. The balance of ingredients makes it easy for small dogs to digest. It is packed with high-quality protein as well as minerals to promote healthy muscles and bones. The carefully selected antioxidants and vitamins support a robust immune system and help your cute little pooch fight off infections. Added to this are the Omega 6 fatty acids and vitamin E which promote a shiny coat and healthy skin. If you like the idea of giving your little friend a moist, warm meal you may prefer a dehydrated dog food. All you have to do is add warm water and you have a meal that is easy to digest with plenty of locked in nutrients. It is described as ‘human grade’ because it is manufactured in facilities that meet FDA safety standards for human food. The recipe in this Shih Tzu food is all natural. The meat base is either wild-caught fish, cage-free turkey, free-range chicken or range-raised beef or. There are no by-products and no added preservatives. It’s available as bags of 2 pounds to 10 pounds. 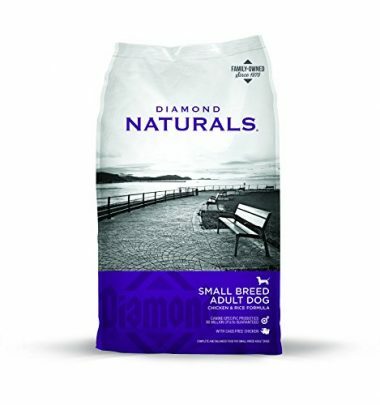 The small breed variety of this brand is free of all grains which can irritate digestion and is rich in protein for healthy muscles. 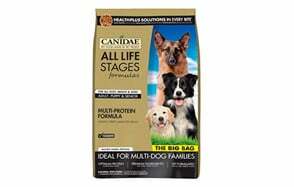 The calorie is specifically formulated to support the higher energy needs of small dog breeds. There is 80% more meat than in traditional dog foods and absolutely no grains or artificial ingredients. The base recipe is made from premium turkey and chicken with added vitamins, minerals and fatty acids like Omega 3 and 6. 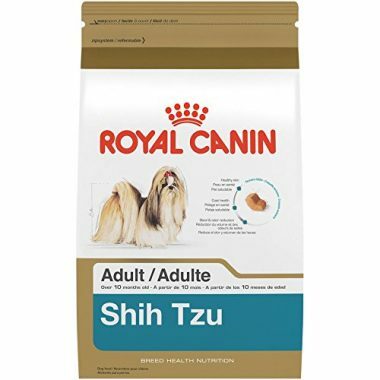 The kibble in this Royal Canin food is specially designed to be easier for your little Shih Tzu to get into their mouths and encourages them to chew. There are elements in the recipe to promote healthy skin (Omega 3 fatty acids and vitamin A) and good hair health by maintaining that natural softness that you love so much! It even helps with the parts of your little pooch that you probably don’t like so much, namely, the smell of their poop. The added Omega 3 fatty acids (EPA and DHA), Omega 6 fatty acids and biotin helps to reduce both the odour and the volume. At the same time, it contains proteins that are easy to digest, fibre and carbohydrate. 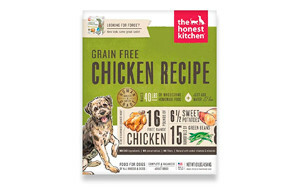 The grain-free real chicken and sweet potato Shih Tzu dog food contains 70% protein and healthy fats. The recipe is prepared from boned chicken in organically certified kitchens and made one batch at a time. As the name indicates, there is no corn, wheat, soy or gluten ingredients. Added to the meat are farm-fresh fruits and vegetables such as sweet potatoes and blueberries as well as vitamins, minerals, Omega 3, Omega 6 and probiotics. The added Glucosamine and Chondroitin promotes healthy hips and joints. A canned wet Shih Tzu dog food made from chicken and pork liver. 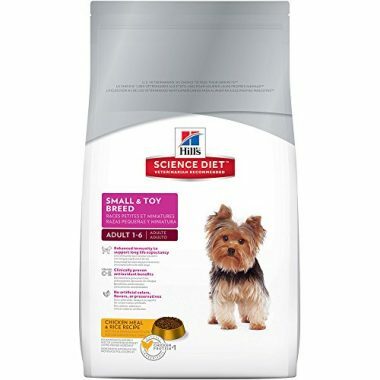 The calories formulation is specifically for small dogs – 977 kCal ME/kg. Added vitamins including vitamin E and Folic acid. Ingredients are high quality and easy-to-digest so they are absorbed quickly to maintain health and fitness. Contains soybean oil and whole grain corn. 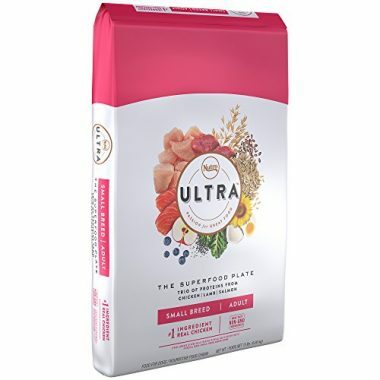 A high protein dog food kibble made from chicken, lamb, and salmon. Added ‘superfoods’ including coconut, chia, kale, and blueberries to deliver antioxidants as well as vitamins and minerals. Added Omega 3 and Omega 6 fatty acids. Made from all-natural ingredients and has no chicken by-product meal, corn, soy or wheat. There are no added artificial flavours, colours, or preservatives. Nutrition is a complex scientific discipline in all species and dogs are no exception. The guidance can be conflicting and changeable leaving Shih Tzu owners confused and perplexed about the best approach to take. 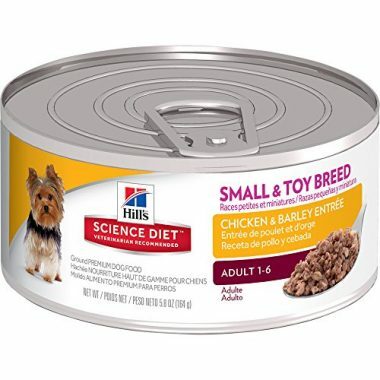 It can seem that you need a degree in biochemistry to understand the labels on some dog food containers and choose the best puppy food for Shih Tzu. The best advice when selecting the best dog food for Shih Tzu is to start reading the ingredients lists and to familiarise yourself with common elements of dog food recipes. There is no single, perfect formulation. However, there are a few things that you can look out for. In general, it is best to opt for foods that list specifically named products. 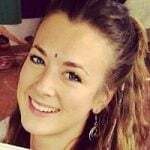 This means that you will where they came from. For example, opt for ‘chicken fat’ rather than ‘animal fat’. There is also an element of trial and error. Each Shih Tzu is an individual with their own metabolism, digestion and taste and texture preference. Fresh meat is always desirable as are fresh vegetables, vitamins, minerals and Omega oils. When you are looking for the best food for Shih Tzu, there are some ingredients that you may want to avoid feeding to your Shih Tzu. That does not mean that they will necessarily cause problems in your pet but they have caused issues in some other dogs and you may want to err on the side of caution. Here is the Shih Tzu food to avoid. Beef is obviously a meat and a good source of protein and fat but it does cause intolerance in some dogs and is not as digestible as chicken, turkey or lamb. Some studies have identified it as the most common allergen in dogs. ‘Derivatives’ is a generic term that describes any part of an animal and will include elements that you may not like the idea of feeding to your pooch! Literally, anything can be thrown in including guts, hair, feathers and even wool. It allows a manufacturer to get around naming undesirable ingredients and it leads to inconsistency between batches. They can simply use whatever is available and go cheap at that time. 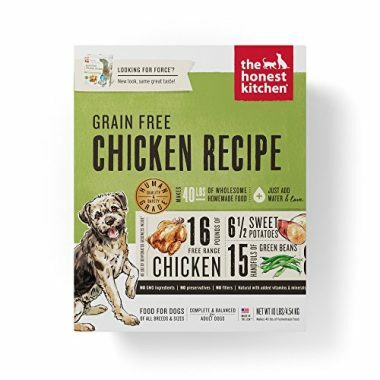 If you want to know exactly what is in the food that you are giving to your Shih Tzu and you want consistency in every pack, this would be one to avoid. This describes parts of slaughtered poultry that do not usually go into human food so it is things like heads, hearts, lungs, and intestines. This is not necessarily a bad thing as they can be a good source of nutrition but it is better if it specifies that it has come from chicken rather than ‘poultry’. This is one to avoid because the term ‘cereals’ doesn’t tell you anything about which grains have been included. If your pooch has an adverse reaction, you have no way of identifying what may have caused it. One batch could be entirely different from the others and so reactions can suddenly occur even though you have used the same brand for many months. Corn is a grain that can cause intestinal problems in dogs because it is hard for them to digest. It is used in dog food as a ‘filler’ because it is cheap but it may be worth you paying a little more to avoid it. Propylene glycol is a preservative that is used in anti-freeze so it is hardly surprising that many dog owners would prefer to not feed it to their dog! There are reports that it can cause hair loss and a dull coat which is the last thing you want for a gorgeous Shih Tzu. Many dog foods contain no artificial preservatives or colours at all and these may be the best option. Soy is a cheap source of protein and therefore attractive to dog food manufacturers. The bad news is that it commonly causes allergic reactions in dogs and is best avoided. Wheat is a very common cause of dietary intolerance in dogs. It is best to opt for foods with an alternative carbohydrate source. You may also like our food guide for Boston Terriers. Most Shih Tzus can look forward to a long and healthy life and there are no widespread health problems associated with the breed. However, you will need to be mindful of the following potential issues. Eye injuries and infections. Their large forward-facing eyes and short muzzle make them prone to eye issues. Umbilical and inguinal hernias. It will show up as a bulge in the abdominal area and must always be checked by a vet. Over-crowded teeth. Due to the shape of the jaw. Allergies and intolerance. Speak to your vet about a change of diet. Q: What should I know about Shih Tzu puppies? A: Your Shih Tzu puppy is likely to be affectionate and friendly and they will adore being with you! They are very alert and can be territorial so they may bark when the doorbell goes. They can be wary of strangers so it is vital that you train and socialise them correctly to stop them becoming temperamental and snappy. Looking after their coat is going to involve a lot of effort. They require daily brushing and there will need to be visits to the grooming salon. The hair around the eyes needs to be trimmed. The colour of their coat can change so the adult dog you end up with maybe a different colour to their puppy coat! Training them can be a challenge as they can be headstrong and stubborn. They can only concentrate for short periods so several short training sessions where you repeat the commands are needed. Housetraining (housebreaking) them can also take time. They are not the dog for you if you expect your pooch to be able to master complex demands! Q: How do I change my Shih Tzu dog’s diet? A: The general advice for changing a dog’s diet is to do it gradually over a period of seven days. Mix the old food with a small amount of the new food and gradually increase the proportion of the new food. However, if you are changing a diet because of health concerns it is vital that you follow veterinary advice on how to switch. Q: How often should I feed my Shih Tzu? A: The instructions of dog foods will give you the recommended feeding schedule for that particular product but if you are in any doubt, your vet will be able to advise you. The number of daily calories that your dog needs will depend on their age, their activity level, their health status and their bone structure. As a general rule, Shih Tzu puppy food is given three times a day but this may be reduced to two bigger meals in mature dogs. Q: Can certain dog food help reduce shedding in my Shih Tzu? A: Even though the Shih Tzu is widely regarded as one of the non-shedding breeds, they will, of course, lose some of their coat. If you notice any problems with your pet’s coat including a loss of texture or the appearance of bald patches you must consult your vet. Diet can play a role in this. It could be an allergy so eliminating certain food ingredients may help or select a food with added Omega oils can help coat shine and strength. A great vet-formulated all-round dried dog food containing no chicken by-products, corn, wheat or soy. The added vitamins, minerals, probiotics and Omega fatty acids promote optimum health. The absence of soy and grains avoids the risk of adverse reactions and stomach upsets.